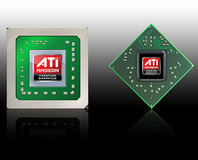 AMD today introduced the ATI Radeon HD 4830, billing it as a product that raises the gaming performance bar for sub-£100 graphics cards. It's based on a cut-down version of the excellent RV770 GPU that is behind the rest of the Radeon HD 4800 series, featuring 640 stream processors (128 five-way superscalar shader units), 32 texture units, 16 ROPs and a 256-bit memory interface. The GPU, which is known as the RV770LE, is clocked at 575MHz while the 512MB of GDDR3 memory runs at 1,800MHz (effective). This should deliver some excellent performance at under £100. We've been feverishly testing the card for a few days now, but we've had a few issues - the biggest so far was some rather strange performance with the reference card we received from AMD. The characteristics just didn't add up against the Radeon HD 4850 - it was too slow and that understandably prompted a lot of head scratching. We went away and started running benchmarks to calculate the card's theoretical throughputs and then we came across some more anomalies when we installed a Radeon HD 4830 we'd received from HIS. The two cards had the same clock speeds but not only showed different performance characteristics in Crysis, but also showed completely different theoretical throughputs. And then we came across this article earlier this morning. Sure enough, we fired up the latest build of GPU-Z and the evidence was right there in front of us. The Radeon HD 4830 we'd received from AMD had three of its ten SIMD cores disabled, meaning only 560 stream processors (112 shader units) were actually enabled. No wonder our performance results looked a little strange. We contacted AMD and a representative said the company was aware of the problem, but it didn't have an official comment on the issue just yet - we'll bring you more as and when we get more information. What we're hoping is that this is limited to the reference cards sent out to AMD, but it's also quite possible that this might break out into the channel if partners have shipped an AMD-built card with a custom sticker. Stay tuned for our Radeon HD 4830 review early next week and, in the meantime, you can discuss this news in the forums.